There are many great things about this week. 1. My sunglasses finally arrived in the mail. No more squinting for me! 2. It’s a three-day workweek. Happy “Friday,” everyone! And 3. There is a five-liter bag of wine sitting in my fridge. These things are not a coincidence. As you hopefully know, tomorrow is the FOURTH OF JULY! This holiday is just about the best one there is. We’re talking food, booze, the great outdoors, more booze…yeah, pretty great indeed. Most July 4th shindigs involve gathering as a group to celebrate this great nation with hot dogs, beer, and plenty of American cheese. Pffft, you didn’t think I’d really fall for that, did you?! Don’t get me wrong, I’m a huge fan of America and all, but a) American cheese is gross and b) I don’t have a barbecue. Instead, I’m opting for an American-fusion menu to feed my patriotic friends, with each Americana picnic classic featuring an overseas twist. Bon Appétit was, as usual, a big help with my menu selections (read: Roast Provençal Chicken and Curried Egg Salad) but the libations were all me. As I mentioned earlier, the 4th of July means drinking, and lots of it, which is why this recipe accounts for so much sangria. Plus, the second you taste the stuff you’ll want to chug your whole glass and go back for seconds. The sweetness of the wine is refreshing in the (hopefully present) sun and the addition of grapefruit soda gives it a tart, effervescent undertone. The fruit adds a patriotic flare and tastes great when soaked in the wine. This libation will go great with whatever you feast on this Thursday and beyond, but please, hold the American cheese. 1. In one or two large pitchers, combine wine, soda, and sugar, stirring with a wooden spoon to blend. 2. Remove the stems from the strawberries and slice each into four pieces. 3. 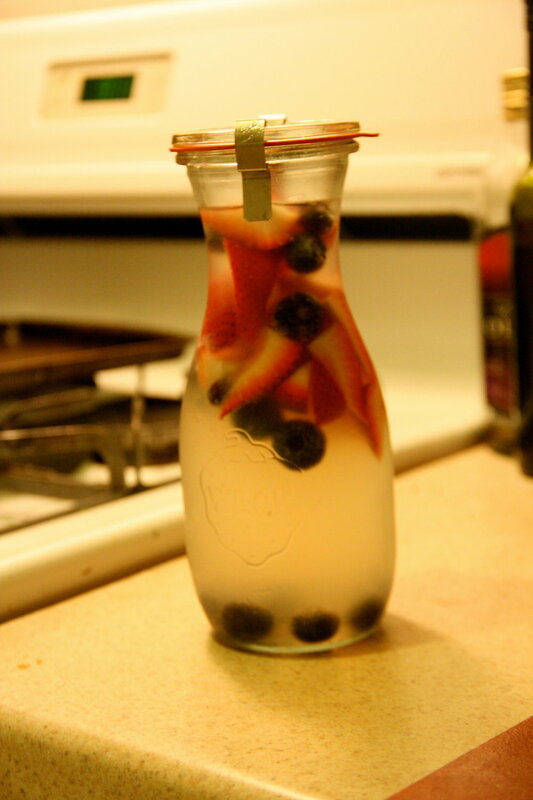 Add blueberries and strawberries to pitcher(s) and stir to combine. 4. Chill at least 1 hour before serving. Party idea: Stop by Crate & Barrel (or shop online) and pick up a bunch of these Weck canning/juice containers. Provide each guest with their own to drink out of as they walk around your party.